There are no genetically modified oats. Visit our Oats & Your Health page to read more about including oats in a gluten-free diet. Two servings of oats per day have been shown to reduce cholesterol 3% more than a low-fat diet alone. Studies are now showing that oats can also help to lower non-HDL cholesterol and the cholesterol carrying protein, apolipoprotein B. Visit our Oats & Your Health page to read more about the cholesterol-lowering properties of oats, as well as information on heart health. Are oats suitable for diabetics? Oats are lower on the Glycemic Index (GI) scale than other starchy grains. Oat groats, steel cut oats and rolled oats are considered a low-to-medium GI food. Oats have been shown to be helpful for improving blood sugar control and lowering blood sugar levels in people with type 2 diabetes. Visit our Oats & Your Health page to read more about the Glycemic Index and including oats in your diabetes adapted diet. Should I eat oats if I am trying to lose weight? The soluble fiber in oats absorbs water and expands to take up space in your stomach, satisfying hunger and providing a feeling of satiety, or fullness. As well, oats digest slowly, prolonging that sensation of feeling full and suppressing the urge to eat before the next meal. Studies have shown that people who include whole grains, including oats, in their diet tend to weigh less than people who do not. Visit our Oats & Your Health page to read more about using oats for appetite control and weight management. Oats contain more protein than most other common grains and are a beneficial part of an active lifestyle. While not a complete protein on their own, oats can be eaten or prepared with dairy products, for example, to create a high-protein meal. Visit our Oats & Your Health page to read more oats and protein. Subscribe for new recipes, great tips and creative ways to enjoy oats everyday, delivered right to your inbox. 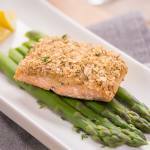 In this tasty, heart-healthy entrée, salmon fillets are brushed with a sweet and savory honey mustard glaze, then topped with oats for a delicious crunch. 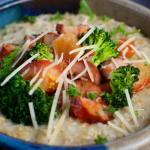 Wake up your taste buds and increase your soluble fiber intake with this creamy oat risotto, topped with spicy chorizo and tender-crisp broccoli. 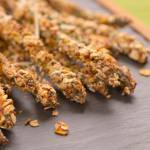 A healthy alternative to fried food, tender-crisp asparagus emerge from the oven in a golden, cheesy oat crust. This simple, elegant appetizer is perfect for entertaining or just snacking.